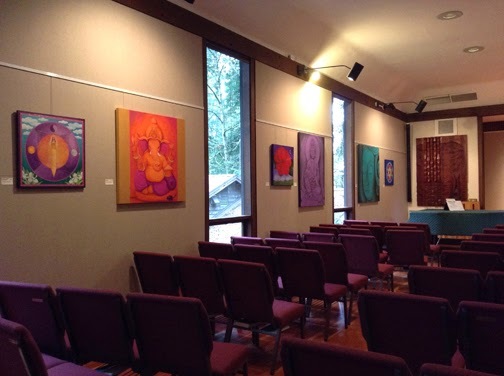 I had the joy of returning to my grad school alma mater, Marylhurst University last weekend to give a presentation entitled, Contemporary Sacred Art and Spiritual Ecology. 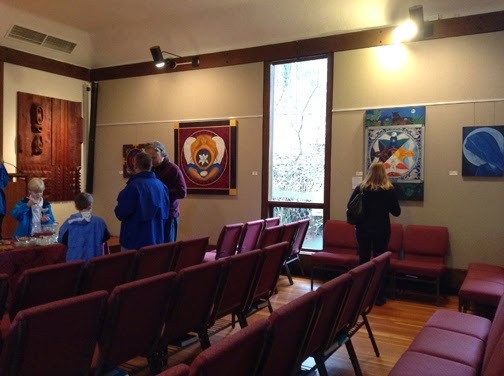 This was part of the annual meeting of the PNW Chapter of the American Academy of Religion, Society of Biblical Literature & The American Schools of Oriental Research. (Click here to learn more). It was very meaningful for me to return to campus, shown here in full bloom, and to share my work with this community of scholars. What is the role of sacred art in the face of climate change? This interdisciplinary presentation is centered on the belief that our current ecological crisis is a spiritual crisis. Those of us in the developed West have become so far removed from our innate interdependence in the web of creation that we are destroying the land base on which all life is dependent. My research shows that this destructive way of being has evolved over the millennia beginning, in part, with the rise of monotheistic religious traditions that reverenced a transcendent God, while rejecting the holiness of the natural world out of fear of being associated with paganism and witchcraft. Alongside this paradigm, we are also seeing a resurgence of indigenous ways of knowing that remind us that the earth is holy and worthy of our reverence. Through my work as an artist and in this paper, I present a synthesis of these two ways of being in relationship to the Sacred that is both transcendent and immanent creating a third narrative as expressed through interspiritual artwork. In conclusion, this project will shed light on the way that contemporary sacred art can help us confront the ecological crisis including species extinction and climate change. Thanks to Louise Paré of CIIS for the photograph during my presentation. World Environment Day was June 5th. It’s a day when the United Nations stimulates worldwide awareness of environmental issues and encourages political action. In conjunction with WED, GPSEN (Greater Portland Sustainability Education Network), a UN-based, growing network of regional educators, students, non-profits, political and industry leaders, and community members collaborating to promote sustainability had their launch celebration. This is quite an honor for Portland. GPSEN has been acknowledged as a Regional Centre of Expertise on education for sustainable development, by the United Nations University. We join a coalition of 129 RCEs around the world committed to creating a healthy, just, and thriving future. I was invited to bring my sacred art and nature mandala ceremony to the event. A Native American elder from Wisdom of the Elders opened with a blessing. Rev. Jayna Gieber from my spiritual community People of the Heart offered a poem for the earth. Appreciate that we were all able to bring the spiritual component to the evening. It brings the Condor heart into the landscape of the Eagle mind as foretold in the ancient prophecy of the Eagle and the Condor.. Gratitude to visionary leader Kim Smith and to so many individuals and organizations working for a sustainable future. Prior to dismantling the mandala I offered this poem from John O’Donohue poem and dedicated this offering to our children, their children, and future generations. It’s for them that we do our work. For love of the earth. Trusting the first warmth of spring. My intention around expansion for the new year seems to be manifesting these days. (See previous post). 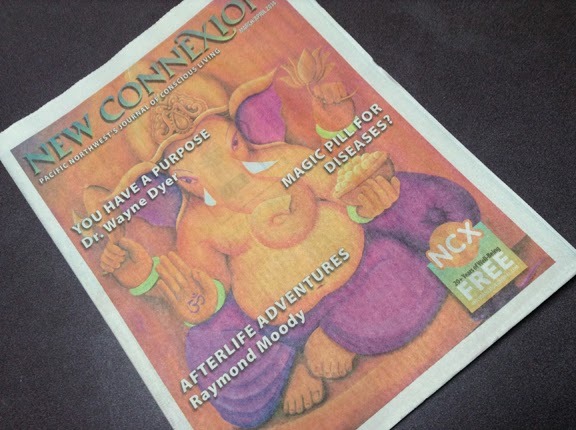 I am having a show of my artwork at the Doll Gardner Gallery inside the West Hills Unitarian during the month of March, my ‘Ganesha’ is the featured artwork on the cover of New Connexions magazine, and I also had a wonderful interview recently with Robyn Purchia at EdenKeeper.org. You can read her article here. We share a similar passion and mission around the connection between religion and the environment. We all know the power of intention and holding a vision even when it’s not quite clear where it will lead. This is the path of radical trust and faith. I appreciated revisiting this poem from Mary Oliver that speaks to that calling we each have inside us to follow our heart in spite of the voices, or culture, shouting their bad advice. I believe deeply that we each have a gift to bring forward in service to what the late eco-theologian Thomas Berry called the Great Work of our time. We need all hands on deck if we want to ensure a liveable planet for future generations. When I spoke aloud my vows at the end of a ten-day training with environmentalist Joanna Macy in 2002, I committed my life to serving the healing of the earth and the welfare of all beings–human and non-human. That has seemed overwhelming at times but it remains the underlying intention for my life and work in whatever form that takes. Will you join me? Macy speaks to three areas of engagement during this era of transformation, or the Great Turning. Perhaps one of them will speak to you. Holding actions (boycotts, civil disobedience); creating new (sustainable) structures and institutions; and shifting consciousness around the reality of our collective interconnectedness in the web of life which has been my primary focus though I have also participated in numerous events and demonstrations around social/ecological justice over the years including the current campaign to stop the Keystone XL pipeline. This year, I plan to share more about ways you might be inspired to get involved though I know so many of you are already doing such great work on behalf of our world. Always, it is my love of the earth, beauty, and the intersection where art, spirit, and earth healing meet that feeds my soul. What feeds yours?